What is Electromagnetic Interference (EMI)? What is Electromagnetic Compatibility (EMC)? Why is EMC testing necessary? EMI is emitted radiation and its effects – a phenomenon. EMC is a device’s ability to limit the levels of unintentionally emitted EMI (that can harm other devices) and also a device’s ability to operate normally when subjected to EMI. Therefore, EMC testing seeks to ensure that a product possesses the characteristic of Electromagnetic Compatibility (EMC): the ability to limit creation of EMI (Electromagnetic interference) and the ability to operate properly when subjected to EMI. Stated differently, EMC testing measures the level of EMI control found in a device, and therefore helps to ensure that unwanted effects are prevented. This diagram explains the elements of an EMI problem. Threats or Noise Sources include both licensed transmitters and the clock oscillators found in a multitude of modern electronics. 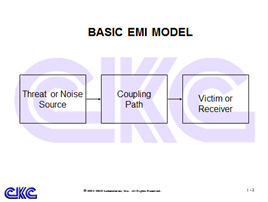 Coupling Paths are the mechanisms by which EMI is able to travel from source to victim. Coupling paths can be radiated, conducted (wire to wire), inductive, capacitive or magnetic. Victims or Receivers consist of actual telecommunication type receivers, digital logic, sensitive video and other analog amplifiers, voltage sensing circuits and others that are affected by EMI. equipment to operate correctly in the presence of electromagnetic disturbances. Emissions tests generally include radiated, AC mains conducted, harmonics and flicker. Susceptibility or Immunity tests generally include radiated, conducted, ESD, electrical fast transients, lightning transients, surge, voltage dips/variations/short interruptions, and magnetic. Click on one of the following links to learn more about CKC’s specific EMC Testing capabilities.